This one-hour training offers basic knowledge about suicide, signs of suicide risk, universal rules for safe firearms storage, and strategies to help keep someone safe if they are considering suicide. The training is FREE to Washington state firearm retailers and instructors. Follow the link below to create an account. When you complete the training, you are entered to win $250. Print and downloadable materials are free for in-state trainees. 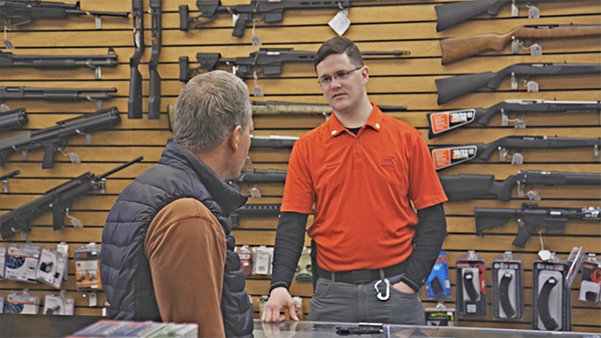 This video, which is included in the training, demonstrates a suicide prevention role-play between a firearms retailer and a customer. Know how locked storage, limited access and temporarily limiting exposure to firearms can reduce suicide. Understand and be able to use LEARN™ steps to support an individual at risk of suicide. Firearms safety is a proud tradition in Washington. Accidental firearms deaths are exceedingly low in our state. The largest risk for death involving a firearm is for boys and men who end their lives by suicide.